Before I get into my love and obsession with overnight oats I want to start with my first love oatmeal in general. During weight loss oatmeal became my staple breakfast most days of the week. Every morning I would wake up excited about the possibilities of my oats. How was I going to jazz them up that day, was I going to make them taste like apple pie with cinnamon, a chopped apple, and a little brown sugar. Was it going to be a more savory day where the oats would be made with peanut butter and a banana. Regardless of which route I went the oats were always warm, delicious, and comforting. It was nice to know that almost anywhere I went to eat I would be able to find oatmeal and I knew I could be happy and satisfied. 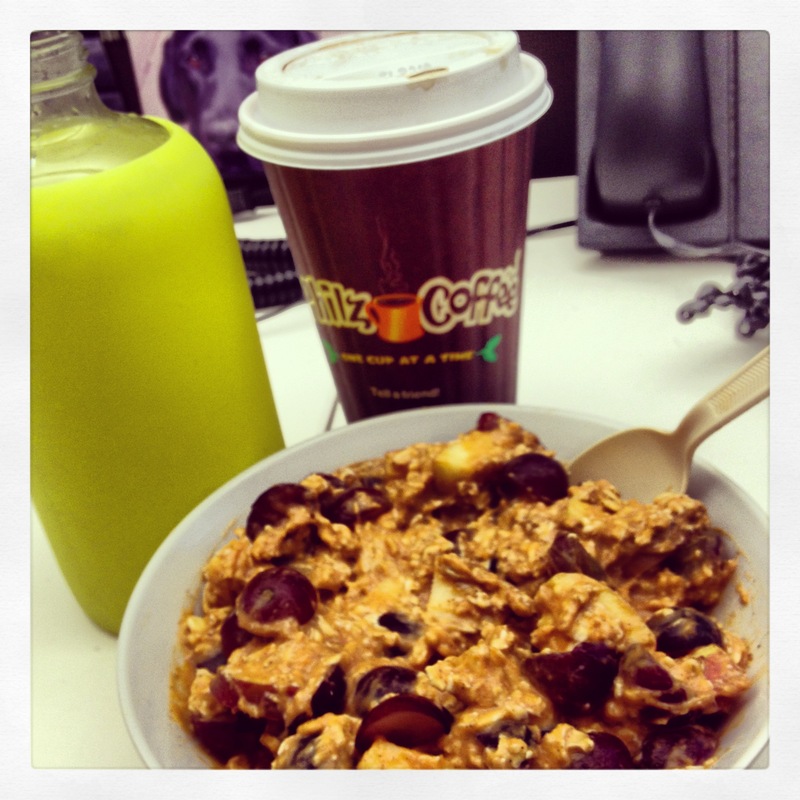 It was not until about a year ago reading one of my favorite blogs I heard of overnight oats. The night before mix all ingredients into a small bowl, cover, and refrigerate overnight. In the morning you just need to stir and serve. I tend to like my oats a little sweeter so I may add in a teaspoon of jelly and I always eat mine with fruit. My favorite is adding in a cup of grapes! This morning I became adventurous and tried Pumpkin Overnight Oats. It was delicious and I enjoyed trying something new, but still not the same as the classic recipe. I also added in half a cup of grapes and a half an apple.